(1) Their heart to minister to married couples is very obvious on their online presence -- which I have been following for quite some time now. Their lessons, words of encouragement, and candor have spoken to me quite often. I have also shared their wisdom to many close friends who needed hear their heart. (2) They have a tender spot for married couples who are in ministry. In fact, they have freely given us their paid (and excellent) 12-month MentorUs subscription program. This is an incredible gift. Robert and I have reaped the benefits of it. (3) They started ministry as youth pastors. They currently live in Nashville, TN. I feel like if there is a couple we hope we can run to for some "been there, done that" advice, it is them. 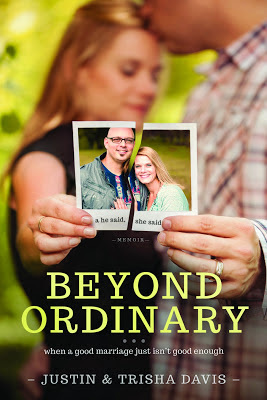 When I heard that Justin and Trisha co-wrote a book on marriage, I knew it was going to be something special. I was certain that it was going to be honest, raw, and genuine. As I started reading "Beyond Ordinary" (Tyndale House Publishers) right before the holidays, it was clear that it did not disappoint. I was drawn to their non-workbook approach. BeyondOrdinary from RefineUs Ministries on Vimeo. Their voices became storytellers. And with these stories, I saw in detail how tiny seeds of discontent played roles in the bigger challenges their marriage faced. Communicating this is crucial, as all married couples are vulnerable to planting these seeds. A few of us recognize it from the get-go and seek remedy. Some of us are not as intuitive, letting these seeds grow into thick, damaging vines that cut off the flow of a healthy, loving marriage. An ordinary marriage is what breeds the more famous marital diseases like dishonor, infidelity or lack of physical intimacy. I am grateful that Justin and Trisha have made themselves vulnerable to the world so that couples can truly believe that even in the depths of brokenness, it is possible to re-claim God's vision of an extraordinary marriage for all of His children. Whether you are married or waiting to be someday, the restoration and redemption of their marriage is something you need to read about. My heart is that you will see God's grace in all of this -- how He relentlessly redeems through His goodness, mercy, and grace. Buy it today and hope that it blesses you. Disclosure of Material Connection: I received the book for free from Tynedale House Publishers. I was not required to write a positive review. The opinions I have expressed are my own. I am disclosing this in accordance with the Federal Trade Commision's 16 CFR, Part 255: "Guides Concerning the Use of Endorsements and Testimonials in Advertising."